Olympus has gotten just about everything right with the new E-PL5 ILC camera. Its 16-Megapixel Live MOS sensor and TruePic VI provide excellent image quality and performance. Adding the best lens collection for an ILC and an accessory for just about everything, you will be happy with camera. Read more in our Full Conclusion. During the fall of 2012, Olympus announced two new Micro Four Thirds PEN series cameras, the "Mini" E-PM2 and the "Lite" E-PL5. Spec-wise, both cameras are virtually identical -- both are advanced Micro Four Thirds camera systems that offer DSLR-quality imagery and video in the bodies of point-and-shoots. Heck, they even feature the same 16.1-megapixel High-Speed Live MOS Sensor and new TruePic VI image processor as Olympus' flagship Micro Four Thirds system camera, the OM-D E-M5. There's also a great Touch AF shutter function where, by tapping the screen, the camera will instant focus on where your finger touched and take a photo (welcome to the future, folks!). 8 frames-per-second high speed shooting will come in handy during sporting events or during nature photography. 1080i HD Video recording is nice, but a little suspect at this price-point (we want to see 1080p). 11 in-camera Art Filters allow users to make their high resolution digital photos look like byproducts of a analog era. Olympus is also pretty excited about FlashAir capability, which boils down to this: Toshiba makes WiFi-capable storage cards and when you combine that with the Olympus Image Share app (for Android and iOS smartphones and tablets), your PEN-series camera can now load images onto phones and social networking sites. Fun. But why two different models, and how do we tell them apart? Glad you asked. The PEN "Lite" E-PL5 actually costs about a $100 more than the E-PM2 (which happens to be the smallest and lightest PEN series camera available) because its 3.0-inch LCD touch screen display swivels 170° up and 65° down (great for self-portraits or you-plus-BFF portraits) and it features all-metal body construction. The E-PL5 also boasts a DSLR-esc Mode Dial, making the camera more customizable than its smaller sibling, as well as Movie Teleconverter function for extra zoom range when shooting video (however, IMHO, Digital Zoom should be avoided at all cost, no matter what the marketing department calls it). Lastly, the E-PL5 comes with a detachable grip. 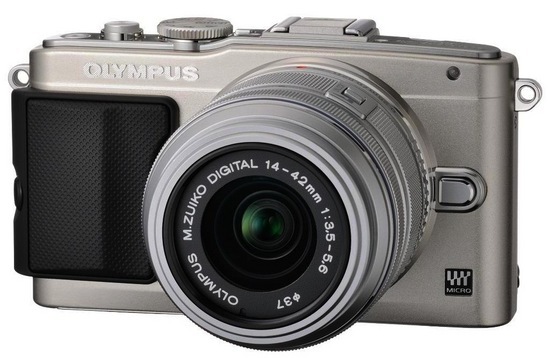 The Olympus PEN "Lite" E-PL5 is availablein silver, black or white. Pricing options include a $649.99 (MRSP) body-only version as well as a $699.99 body plus MSC M.ZUIKO® DIGITAL ED m14-42mm II R f3.5/5.6 Zoom Lens. Click on our Lowest Price button at the top right of this page to see the most current online pricing.